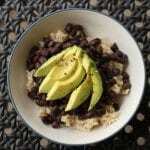 Avocado, Rice, and Beans | JPMA, Inc.
Bring 1 cup of water to a boil with ½ tsp. salt (optional). Stir in rice. Cover and cook over low heat until water is absorbed, about 45 minutes, or cook rice in a rice cooker. Meanwhile, rinse and drain beans. Cook over low heat in a small saucepan, or in the microwave. Add black pepper, ground cumin or other spices as desired. Cut avocado into slices or dice into small pieces. Serve rice with beans on top, and garnish with avocado pieces.